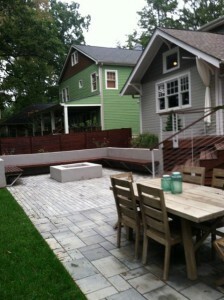 Is your outdoor living space an asset to your home, or could it be more functional and appealing? At Vision Green, we are pleased to offer full-service installation, design and maintenance for your outdoor living environment. From the initial design phase to the maintenance after the work is complete, our team will ensure that your hardscape is exactly what you are imagining. Our comprehensive list of products and services will ensure that your hardscapes, including your patio, walkways, brickwork, retaining walls and more, are an asset to your yard. With our design professionals working on the project, you can ensure that your outdoor living area will blend in with your landscape seamlessly, creating a functional retreat in your yard. Adding a patio space or walkway to your garden increases the comfort and function of your yard, and we are ready to help with the task. Retaining walls improve the safety and look of your yard. Our hardscape materials are designed to blend in well with the surrounding environment. We work with natural stone and organic materials to create an outdoor space that is as aesthetically appealing as it is functional. Even our brick and concrete are designed to look as natural as possible. Yet not all of our hardscape materials are simply functional pieces. We also offer urns, fountains, waterfalls and fire pits to add interest and dimension to the space. We will work with you to design and then build an outdoor living area that perfectly matches your goals and desires for your space. Do you have a goal for your outdoor living space? Whether you are designing a simple patio or a full outdoor kitchen and entertaining space, you need the professional services of our team to ensure that your vision is realized. Contact Vision Green today for a free quote or to talk to one of our designers. Together, we can turn your vision into a reality! Vision Green Landscape has a team of landscaping experts who are ready to come alongside Charlotte area homeowners and businesses to assist with lawn maintenance needs of all types. Our team is made up of people who are passionate about their work and who are deeply knowledgeable about what makes a yard beautiful. With the help of our landscaping professionals, you can turn your outdoor living space into the exact space you are dreaming it can be.